Scaling up – that is efforts to expand public health interventions from small-scale feasibility studies to wider state, national and international roll-out – is an important way to achieve population-wide health improvements. However, not all interventions that work on a small scale can be expanded under real-world conditions to reach more people and still be effective. There is limited literature describing frameworks for scaling up public health interventions. Additionally, these frameworks remain largely untested using real-world policy and practice case studies and pay insufficient attention to the economic and system factors that might inform scaling up such interventions. Further developing conceptual models and tools for scaling up using systems thinking and economic methods. Tools and guidelines for policy makers, practitioners and researchers to use to scale up health interventions. This research will assist in defining and characterising examples of scaled-up interventions in Australia and elsewhere. This is relevant to research translation and to identifying system approaches to chronic disease prevention. Case studies and reviews will identify the components that contribute to successful scaled-up health interventions. These outcomes will assist policy makers and practitioners to use best practice when scaling up public health interventions. This was the first study to classify and quantify the potential pathways through which public health interventions in high income countries are scaled up to reach the broader population. 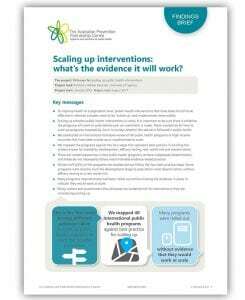 The scale up of public health interventions often follows a range of pathways which are informed by differing levels of intervention evidence. Almost half (45%) of the programs we studied did not follow the four best practice steps. Some programs went directly from the development stage to population-wide dissemination, without efficacy testing or a real-world trial. Many programs internationally had been rolled out without having the evidence in place to indicate they would work at scale.